How to Sync iPhone to New Computer without Losing Data? How to Sync iPhone to New Mac PC Without Losing Everything? Tradditionally, syncing iPhone to new computer is to make iTunes on the new computer accept your device and then transfer or backup iPhone data to the new computer, but this is allowable only with the premise that you agree to the "Remove and Sync" message asking you to erase all the content on your iPhone and then sync the data in the new computer's iTunes Library to iPhone. If you don't mind losing any important data on your device, you can just go on with iTunes. If you care about photos, contacts, videos or anything important on iPhone, how can you sync iPhone to new computer without losing data? DearMob iPhone Manager is such a tool that can help sync iPhone to new computer with any original file remaining on iPhone. You can bulk backup iPhone XS Max/XS/XR to new computer or selectively transfer music, photos, videos, apps, contacts, messages, etc to new computer without iTunes. Actually, there are two meanings of syncing iPhone to new computer depending on your requirements: to sync iPhone to new computer to make contents sharable without loss between iPhone and computer; or to backup iPhone data to new Mac PC securely under the circumstance that your old computer is out of condition but you don't mind losing data on iPhone. Want to sync iPhone to new computer without erasing any data on iPhone after you unplug your iphone from another computer? This situation exactly meets the demands when you want to sync iphone to new Mac/PC or more than one computer to get something new to your iPhone, as Apple by default allows you to only sync iPhone with one computer at a time via iTunes. No matter you like it or not, iTunes always warn you with this message "Are you sure you want to remove existing music, movies, TV shows, books, and tones from this iPhone and sync with this iTunes library?" Once you tap the 'Remove and Sync' button, all the iTunes data on your iPhone will be removed instantly without hesitation. So, here is a guide to sync iPhone to new computer without losing data to make up for the imperfection of iTunes. Step 1. Download DearMob iPhone Manager, install and launch it on your computer. Supposing you didn't have installed iTunes on your computer containing Apple Mobile Device USB driver to help connect iPhone to computer, you may need to follow a must-have but simple guide from DearMob iPhone Manager to get the necessary component to make computer to recognize iPhone without iTunes. Step 2. Once launched, you will be asked to connect your iPhone to computer via USB cable. As this is your first time to sync iPhone to new computer, you need to tap "Trust This Computer" on your iPhone to continue. Step 3. 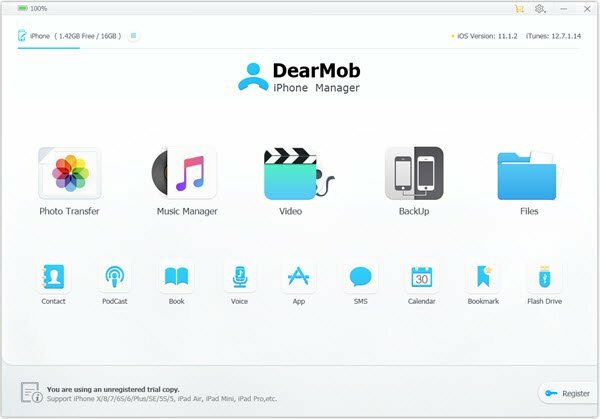 After connection, you will access the main user interface of DearMob iPhone Manager where 12 types of iPhone data including photos, music, videos, apps, sms, contacts, etc are available for you to handle. For example, you can click Music Manager icon and follow the guide DearMob iPhone Manager offers to easily manage iPhone music like transferring, editing, adding and deleting iPhone music. But here guessing you are more likely to batch sync iPhone to new computer without losing everything either on iPhone or computer, it is recommended that you simply click Backup icon to backup iPhone to new computer in batch and restore anything you saved to iPhone without erasing the original music, photos, contacts, etc. Actually, it is not that terrifying of syncing iPhone to new computer via iTunes. When you click on "Erase and Sync", only the old iTunes contents on iPhone will be removed and erased, not anything else on the device. 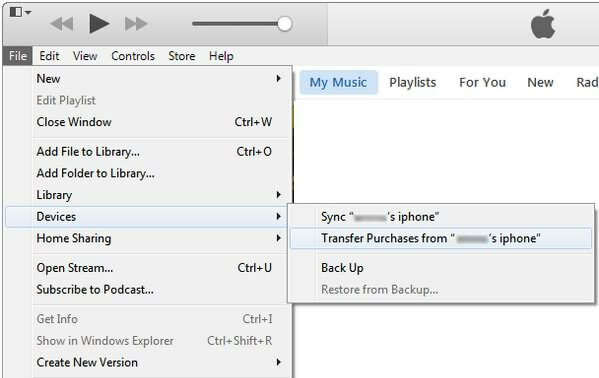 So, if you don't mind losing these kinds of data, you can simply click the "Erase and Sync" button to continue syncing your iPhone though we highly suggest you to use third-party tool to transfer music, videos or ringtones from old iTunes Lirary to the new computer for backup. Step 1. Connect your iPhone to the new computer via USB cable, tap "Trust This Computer" on your iPhone and then launch iTunes on the new computer to make iTunes recognize your iPhone. Step 2. Authorize the new computer. As this your first time to use iTunes on the new computer, you should first log in with your Apple ID and then go to Account > Authorizations > Authorize This Computer. Step 3. Transfer purchases from iPhone to new PC or Mac: go to File -> Devices -> Transfer Purchases from iPhone. This process is only available for purchased items from iTunes Store, and you have to make use of third-party tool like DearMob iPhone Manager if you want to transfer non-purchase music, videos, movies, etc to the new computer. Notice: Think twice before you click the "Remove and Sync" button. If you still value the contacts, photos, or messages from your friends, families, colleagues, you can refer to method 1 to sync iPhone to new computer without losing data. DearMob iPhone Manager is a more considerate way to manage iPhone contents without losing everything. You can just bulk backup iPhone to new computer in a click or selectively transfer videos, music, photos, books, contacts, messages, etc from iPhone or iPad to Mac/PC in a visible way and flash speed. Just have a try!